Name Variation Celia M. Bindl was also known as Cecelia. Married Name 24 May 1932 As of 24 May 1932,her married name was Neuheisel. Celia M. Bindl was born on 31 August 1911 at Wisconsin. She was the daughter of Alois Alferd Bindl and Clara T. Lins. Celia M. Bindl married Hubert P. Neuheisel, son of Heinrich Neuheisel and Katherine Brechtl, on 24 May 1932. Celia M. Bindl died on 2 October 2005 at age 94 Celia M. Neuheisel, age 94, of Spring Green, passed away on Sunday, Oct. 2, 2005, at the Greenway Manor Nursing Home. She was born on Aug. 31, 1911, in Plain, the daughter of Alois and Clara (Lins) Bindl. Celia was married on May 24, 1932, to Hubert P. Neuheisel and together they farmed for 35 years. She was a member of St. John's Catholic Church, Spring Green Homemakers Club for 50 years and was a quilter for Project Linus. Survivors include her five children, Joanne (Francis) Murphy of Madison, Marita (Carl) Moenssens of Paris, Tenn., Eugene (Delores) Neuheisel of Spring Green, Leon (Madge) Neuheisel of Platteville, and Karen (Cyril) Haslow of Mount Vernon, Ill; 15 grandchildren, Dennis, Mary Beth, Jim, Diane, Maureen, Carol, Rick, Mike, Renee, Jeff, Lynn, Sherrie, Dana, Kristin and Katrina; 20 great-grandchildren; eight step-great- grandchildren; a sister, Rosemarie (Bernard) Durst of Verona; two brothers, George (Charlotte) Bindl of Sextonville, and Alois Bindl Jr. of Plain; many nieces, nephews, other relatives and friends. She was preceded in death by her parents, Alois and Clara Bindl; her husband, Hubert Neuheisel in 1986; a great-grandson, Jake Quinn; two infant brothers, Henry and Alois; a brother, Edward; and three sisters, Mary Maerz, Clara Schwoerer and Dorothy Haag. A Mass of Christian Burial will be held on Wednesday, Oct. 5, 2005, at ST. JOHN'S CATHOLIC CHURCH in Spring Green at 11 a.m. Father Mike Resop will officiate with burial in the church cemetery. Visitation will be held on Tuesday, Oct. 4, 2005, at the RICHARDSON-STAFFORD FUNERAL HOME from 4 p.m. to 7 p.m., and on Wednesday at the church from 10 a.m. until the time of service. The Richardson-Stafford Funeral Home is assisting the family with the arrangements. Celia M. Bindl was educated in 1940 at through 8th grade. [S373] U.S. Federal Census 1940 U.S. Federal Census, by Ancestry.com, ED56-36. Page 1B. Dwelling 16. Name Variation Alfred George Bindl was also known as Albert. 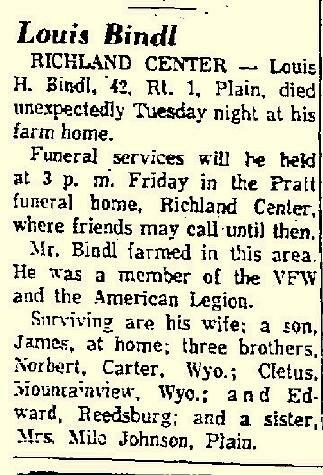 Alfred George Bindl was born on 4 August 1914 at Wisconsin. 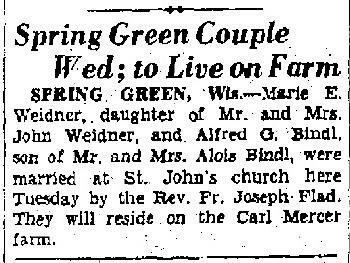 Alfred George Bindl married Marie G. Weidner, daughter of John J. Weidner and Lillian C. Meixelsperger, on 20 May 1941 at Wisconsin Marie Weidner and Alfred Bindl wedding announcement. Alfred George Bindl died on 25 January 2005 at age 90 Alfred G. Bindl, age 90, of Richland Center, and formerly of Bear Valley, passed away on Tuesday, Jan. 25, 2005, at Pine Valley Health Care and Rehabilitation Center. He was born on Aug. 4, 1914, in Plain, the son of Alois and Clara (Lins) Bindl. He was married on May 20, 1941, to the former Marie Weidner. Alfred was a member of St. Kilian's Catholic Church in Bear Valley. Survivors include five children, Ralph Bindl of Hillpoint, Carol (Ted) Purcell of Prairie Du Sac, Rita (Richard) Hall of Praire Du Sac, Robert (Diane) Bindl of Richland Center, and Joanne (Bill) Hall of Richland Center; five grandchildren, Randy (Polly) Ruhland of Littleton, Colo., Denice Ruhland (fiance Jason) of Waunakee, Michael Hall of Chicago, Ill., Rachel Hall of Richland Center, and Karen Hall of Madison; two brothers, George (Charlotte) Bindl of Lone Rock, and Alois Bindl Jr. of Plain; three sisters, Celia Neuheisel of Spring Green, Dorothy (Alvin) Haag of New Glarus, and Rosemarie (Bernard) Durst of Richland Center; nieces; nephews; other relatives; and friends. He was preceded in death by his parents, Alois and Clara Bindl; his wife, Marie Bindl, on April 5, 1999; three brothers, Henry (infant), Alois (infant) and Edward; two sisters, Mary Maerz and Clara Schwoerer; three brothers-in-law, Hubert Neuheisel, Edward Schwoerer and William Maerz; and two sisters-in-law, Alberta Bindl and Marian Bindl. A Mass of Christian Burial will be held on Saturday, Jan. 29, 2005, at 11 a.m. at ST. JOHN'S CATHOLIC CHURCH in Spring Green. Father Del Klink will officiate with burial in the St. John's Catholic Cemetery. Visitation will be held on Friday, Jan. 28, 2005, at the RICHARDSON-STAFFORD FUNERAL HOME, Spring Green, from 5 p.m. until 8 p.m., where a rosary will be recited at 7:30 p.m. Visitation will also be held at the church on Saturday from 10 a.m. until the time of service. The Richardson-Stafford Funeral Home is assisting the family with the arrangements. Alfred George Bindl obtained US Social Security Card at Wisconsin; last residence Richland Center, Richland, Wisconsin. 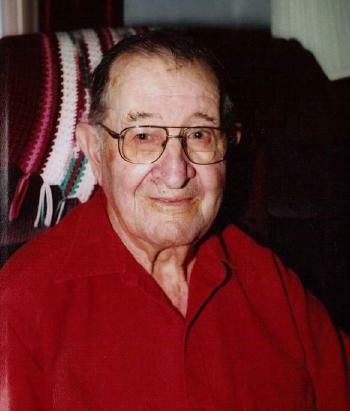 George Alois Bindl was born on 2 October 1916 at Franklin, Sauk, Wisconsin. George Alois Bindl died on 20 November 2010 at age 94 George A. Bindl, age 94, of Lone Rock, died unexpectedly Saturday, November 20, 2010 at his home. He was born October 2, 1916 in Plain, Wisconsin the son of Alois Joseph & Clara (Lins) Bindl. On December 30, 1978 he married Charlotte (Newkirk) Ghastin. George was a life long farmer, loved gardening, mowing lawn and was a very proud grandpa. He drove for the Commission on Aging for many years and was a member of St. Mary’s Catholic Church. Survivors include his wife Charlotte Bindl of Lone Rock; Stepson Kirk (Amy) Ghastin of Lone Rock; stepdaughter Kathy (John) Allbaugh of Richland Center; 5 grandchildren Michelle & Alyssa Allbaugh, and Ross, Ryan, & Reese Ghastin; A sister Rosemary Durst of Madison; a brother Alois “Junior” Bindl of Spring Green; many nieces, nephews, other relatives & friends. He was preceded in death by his parents, 6 siblings Celia Neuheisel, Alfred Bindl, Clara Schwoerer, Edward Bindl, Mary Maerz, and Dorothy Haag. A Mass of Christian Burial will be held on Wednesday, November 24, 2010 at 11:00 AM at the St. Mary’s Catholic Church in Richland Center. Fr. Emmanuel Famiyeh will officiate with burial in the St. Mary’s Catholic Cemetery. Friends may call on Tuesday at the Stafford Funeral Home in Richland Center from 4:00 PM to 7:30 PM where a scripture service will be held at 7:30 PM. Friends may also call on Wednesday at the church from 10:00 PM until the time of services. In lieu of flowers memorials may be made to St. Mary’s Catholic Church. Married Name 20 April 1948 As of 20 April 1948,her married name was Schwoerer. Clara Emma Bindl was born on 20 March 1919 at Plain, Sauk, Wisconsin. Clara Emma Bindl married Edward H. Schwoerer, son of (?) Schwoerer, on 20 April 1948. Clara Emma Bindl died on 19 February 2004 at age 84 Clara E. Schwoerer, age 84, of Perry Township, died on Thursday, Feb. 19, 2004, at the New Glarus Home. She was born on March 20, 1919, in Plain, to Alois and Clara (Lins) Bindl. She married Edward H. Schwoerer on April 20, 1948, at St. Luke's Catholic Church in Plain. Edward died on Aug. 26, 2002. They farmed in Perry Township area all of their married life. She was a member of Holy Redeemer Catholic Church and a member of the Catholic Family. Survivors include four daughters, Judith (Gerald) Gericke of Waunakee, Alice (Dean) Bertelrud of New Glarus, Lois (David Lange) Herfel of Mount Horeb, and Jane (Melvin) Dosch Jr. of Blanchardville; three sons, Dennis (Rose Mary) Schwoerer of Waunakee, and David and Glenn Schwoerer, both of Mount Horeb; nine grandchildren, Shawn (Rich) Reilly and Matthew (fiancee, Daniela Neymann) Gericke, Chris and Dan Schwoerer, Casey and Leah Herfel, Lindsay and Cortney Bertelrud and Hannah Dosch; a step- grandson, Robert (Amanda) Dosch; three step-great-grandsons, R. Lee Dosch, and Aaron and Michael Reilly; three sisters, Celia Neuheisel of Spring Green, Dorothy (Alvin) Haag of Mount Horeb, and Rosemary (Bernard) Durst of Richland Center; three brothers, Alfred Bindl of Richland Center, George (Charlotte) Bindl of Lone Rock, and Alois Bindl of Plain; and a brother-in-law, Albert Schwoerer of Mount Horeb. She was preceded in death by her parents; her husband; three children in infancy; three brothers (two in infancy); a sister; six sisters-in-law; and five brothers-in-law. A Mass of Christian Burial will be held at 10:30 a.m. on Monday, Feb. 23, 2004, at ST. IGNATIUS CATHOLIC CHURCH in Mount Horeb, with Father Sanctus K. Ibe officiating. Burial will be at Holy Redeemer Catholic Cemetery. Friends may call from 3 p.m. until 7 p.m. on Sunday, Feb. 22, 2004, at ELLESTAD FUNERAL HOME, 500 N. Eighth St., Mount Horeb, where a prayer service will be held at 7 p.m. www.ellestadfuneralhome.com. Alvin J. Bindl was born circa December 1929 at Wisconsin. He was the son of Albert J. Bindl and Adelia E. Soeldner. 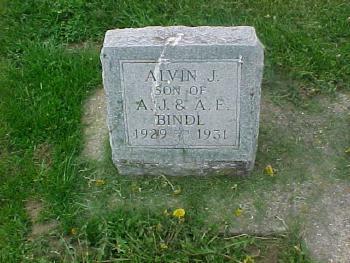 Alvin J. Bindl was buried in 1931 at St Luke Catholic Cemetery, Franklin, Sauk, Wisconsin. [S250] U.S. Federal Census 1930 U.S. Federal Census, by Ancestry.com, ED56-31. Dwelling 98. Edward J. Bindl married Alberta J. (?). Edward J. Bindl was born on 30 March 1921 at Wisconsin. 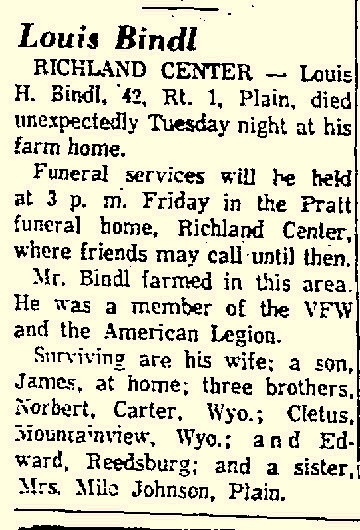 Edward J. Bindl died on 30 June 1971 at age 50 Edward J Bindl, 50, obituary. Edward J. Bindl obtained US Social Security Card at Wisconsin; last residence not specified. Married Name 6 October 1953 As of 6 October 1953,her married name was Maerz. Mary Theresa Bindl was born on 18 February 1923 at Plain, Sauk, Wisconsin. Mary Theresa Bindl married William F. Maerz, son of Peter Maerz and Barbara Endres, on 6 October 1953. Mary Theresa Bindl died on 28 February 2002 at age 79. Mary Theresa Bindl obtained US Social Security Card at Wisconsin; last residence Sauk City, Sauk, Wisconsin. Married Name 2 May 1950 As of 2 May 1950,her married name was Haag. Dorothy Margaret Bindl was born on 28 February 1925 at Plain, Sauk, Wisconsin. Dorothy Margaret Bindl married Alvin R. L. Haag, son of Lawrence G. Haag Jr. and Genevieve Bilse, on 2 May 1950. Dorothy Margaret Bindl died on 10 August 2005 at age 80 Dorothy M. Haag, age 80, went to meet with the Lord and her family on Wednesday, Aug. 10, 2005, at St. Marys Hospital in Madison. She was born Feb. 28, 1925, in Plain, to Alois and Clara (Lins) Bindl. She loved to garden, crochet and embroider. Dorothy married Alvin R. Haag on May 2, 1950, at St. Luke's Catholic Church in Plain. She lived her life on the family farm where she raised her nine children. She was a member of Holy Redeemer Catholic Church and of its Council of Catholic Women. Survivors include her husband, Alvin; children, Norbert Haag of Mount Horeb, Arlene (Wayne) of DeForest/ Madison, Jerome Haag of Mount Horeb, Delores (Charles) Baeten of Downers Grove, Ill., Inez (Daniel) Martin of Fennimore, Jeanette Martin of Mount Horeb, Virgil (Dawn) Haag of Mount Horeb, Beth Ann (Ivan) Hellenbrand of Waunakee, and Andrew (fiancee, Brenda) Haag of Mount Horeb; 17 grandchildren; two sisters, Celia Neuheisel of Spring Green, and Mary (Bernard) Durst of Verona; two brothers, George (Charlotte) Bindl of Lone Rock, and Alois Bindl Jr. of Plain; and many nieces, nephews, cousins and friends. She is preceded in death by her parents; two brothers, Alfred Bindl and Edward Bindl; two sisters, Clara Schwoerer and Mary Maertz; and two infant siblings. Mass will be held at 2 p.m. on Sunday, Aug. 14, 2005, at ST. MARY'S OF LOURDES CATHOLIC CHURCH in Belleville, with Father Ken Klink officiating. Burial will be at Holy Redeemers Cemetery in Perry Township. Friends may call from 3 p.m. until 7 p.m. on Saturday, Aug. 13, 2005, at ELLESTAD FUNERAL HOME, 500 N. 8th St., Mount Horeb, with a prayer service at 3 p.m. Friends may also call after 1 p.m. on Sunday at the church. The love of her life was her family and friends. MOTHER May you always walk in sunshine And Gods love around you flow. For the happiness you gave us, No one will ever know. It broke our hearts to lose you, But you did not go alone A part of us went with you, The day that God called you home. A million times weve needed you, A million times weve cried, If love could only have saved you, You never would have died. Dorothy Margaret Bindl obtained US Social Security Card at Wisconsin; last residence Mount Horeb, Dane, Wisconsin. Name Variation Alois Bindl Jr. was also known as Junior. Name Variation Alois Bindl Jr. was also known as Aloysius. 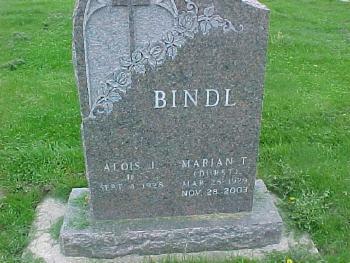 Alois Bindl Jr. was buried at St Luke Catholic Cemetery, Franklin, Sauk, Wisconsin. He was born on 4 September 1928 at Wisconsin. 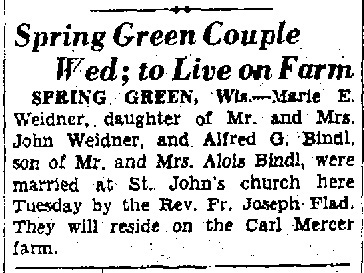 Alois Bindl Jr. married Marian T. Durst, daughter of Hubert A. Durst and Mary Catherine Killoy, on 8 September 1952. Name Variation Anna M. Brei was also known as Annie. Married Name 29 May 1906 As of 29 May 1906,her married name was Bindl. Anna M. Brei was born in August 1887 at Wisconsin. She was the daughter of Michael Brei and Catharine Fellner. Anna M. Brei married Rupert Bindl, son of Michael Bindl and Emilia Weishahn, on 29 May 1906 at Plain, Sauk, Wisconsin. Anna M. Brei died in 1937. [S245] U.S. Federal Census 1900 U.S. Federal Census, by Ancestry.com, ED134. Dwelling 106. Name Variation Adela E. Bindl was also known as Adala. Married Name 24 November 1937 As of 24 November 1937,her married name was Johnson. Adela E. Bindl was born on 29 November 1908 at Sauk, Wisconsin. She was the daughter of Rupert Bindl and Anna M. Brei. Adela E. Bindl married Milo Johnson on 24 November 1937. Adela E. Bindl died on 27 February 1995 at age 86. Elsie Bindl was born in 1911 at Wisconsin. Elsie Bindl died in 1929. Norbert John Bindl was born on 14 May 1914 at Wisconsin. He was the son of Rupert Bindl and Anna M. Brei. Norbert John Bindl married Marian Gladys Pope on 12 November 1938 at first marriage for her. Norbert John Bindl died on 13 February 1980 at age 65. Louis Bindl married (?) Johnson. Louis Bindl was born on 21 February 1919 at Wisconsin. Louis Bindl died on 26 December 1961 at Plain, Sauk, Wisconsin, at age 42. 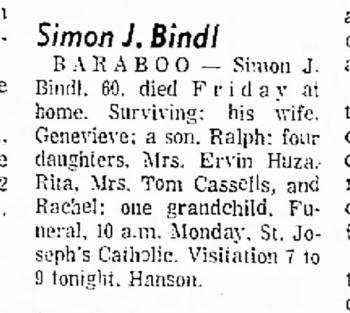 Simon J. Bindl was born on 9 November 1913 at Wisconsin. Simon J. Bindl married Genevieve Marie Dischler, daughter of Joseph Dischler and Mary Laubmeier, between 1935 and 1940. 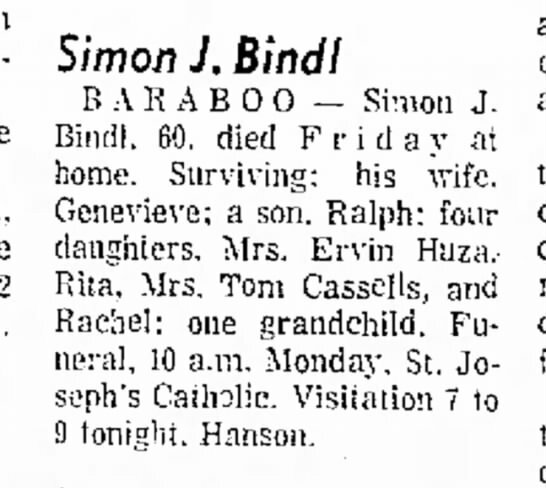 Simon J. Bindl died on 21 September 1973 at age 59. Simon J. Bindl obtained US Social Security Card at Wisconsin; last residence not specified. Married Name 23 October 1946 As of 23 October 1946,her married name was Brey. 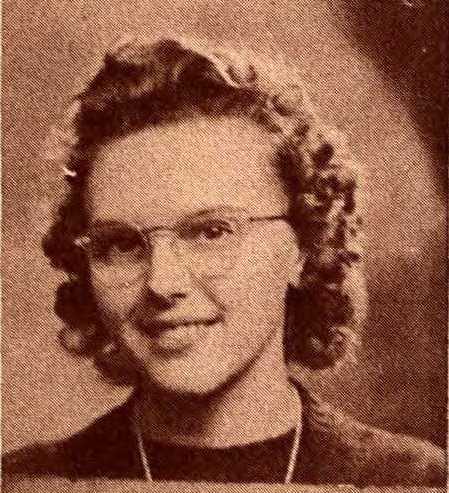 Mildred Teresa Bindl was born on 21 December 1926 at Reedsburg, Sauk, Wisconsin. She was the daughter of Albert J. Bindl and Adelia E. Soeldner. Mildred Teresa Bindl married John Arthur Brey, son of Arthur John Brey and Anastasia Brickl, on 23 October 1946 at Reedsburg, Sauk, Wisconsin. Mildred Teresa Bindl died on 30 December 1994 at Reedsburg, Sauk, Wisconsin, at age 68 Mildred T (Bindl) Brey obituary. Mildred Teresa Bindl graduated in 1944 at Reedsburg High School, Reedsburg, Sauk, Wisconsin. Married Name 15 May 1928 As of 15 May 1928,her married name was Bindl. Catherine R. Gruber was born on 6 September 1906 at Plain, Sauk, Wisconsin. She was the daughter of Joseph Gruber and Emma Alt. Catherine R. Gruber married Henry William Bindl, son of Henry Jacob Bindl and Theresia Kate Dischler, on 15 May 1928 Catherine Gruber - William Bindl marriage announcement. Catherine R. Gruber died on 22 February 2000 at age 93 Catherine R (Gruber) Bindl obituary. Catherine R. Gruber obtained US Social Security Card at Wisconsin; last residence Madison, Dane, Wisconsin. [S250] U.S. Federal Census 1930 U.S. Federal Census, by Ancestry.com, ED56-34. Dwelling 54. Effie Byrne was born on 10 December 1880. George Byrne was born in 1882. Name Variation Daniel Brickl was also known as Brneckl. Name Variation Daniel Brickl was also known as Brueckel. Name Variation Daniel Brickl was also known as Bruckl. Name Variation Daniel Brickl was also known as Bruckel. Daniel Brickl was born circa 1823 at Bavaria, Germany. He was the son of Simon Brickl and unknown (?). Daniel Brickl married Maria Retzer before 1852. Daniel Brickl married Catherine Retzer before 1865. Daniel Brickl died on 21 August 1887 at Franklin, Sauk, Wisconsin. His estate was probated on 6 September 1887 at Sauk, Wisconsin. Name Variation Maria Retzer was also known as Mary. Name Variation Maria Retzer was also known as Ritzer. Married Name before 1852 As of before 1852,her married name was Brueckel. Married Name before 1852 As of before 1852,her married name was Brickl. Married Name before 1852 As of before 1852,her married name was Bruckel. Married Name before 1852 As of before 1852,her married name was Brneckl. Maria Retzer was born circa 1820 at Bavaria, Germany. She married Daniel Brickl, son of Simon Brickl and unknown (? ), before 1852. Maria Retzer died before 1865. Daniel George Brickl was born on 21 March 1857 at Bavaria, Germany. He was the son of Daniel Brickl and Maria Retzer. Daniel George Brickl married Mary Blau, daughter of Michael Blau and Barbara Dobmeier, on 12 November 1884 at Franklin, Sauk, Wisconsin, Mary's first husband was Daniel George Brückl (Jr.). They were married November 12, 1884 at St. Luke Catholic Church in Plain by Father Henricus Keonig. Witnesses were Michael Blau and Elizabeth Voelker. The Weekly Home News of November 13, 1884 reported, "Mr. Joseph Blow [Blau] and Miss Annie Brickle [Brückl] were united in the holy bonds of matrimony at St. Luke's Church Tuesday, by Rev. Father Koning of Keyesville. At the same time and place Mr. Daniel Brickle [Brückl] and Miss Mary Blow [Blau] were married by the same gentleman." Daniel died July 7, 1900 after an operation. 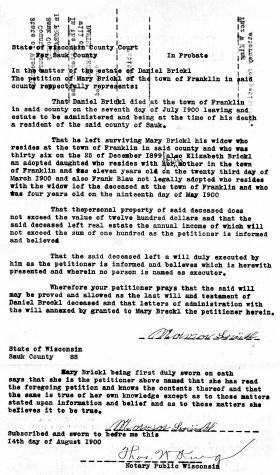 Daniel George Brickl was listed as a beneficiary in Daniel Brickl's will on 6 September 1887 at Sauk, Wisconsin. Daniel George Brickl died on 7 July 1900 at after an operation, Sauk, Wisconsin, at age 43. His estate was probated on 31 March 1902 at Sauk, Wisconsin. Daniel George Brickl witnessed the adoption of Elizabeth Brickl circa 1891 at from an orphanage, LaCrosse, Wisconsin. 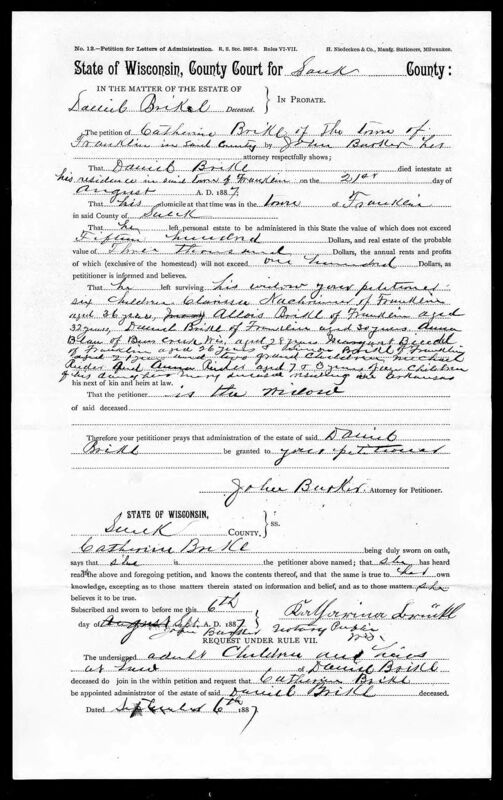 Daniel George Brickl witnessed the adoption of Frank John Blau in April 1898 at by his aunt and uncle after his mother died after childbirth. Name Variation Anna Teresa Brickl was also known as Bruckl. Married Name 12 November 1884 As of 12 November 1884,her married name was Blau. Anna Teresa Brickl was born on 23 September 1859 at Bavaria, Germany. 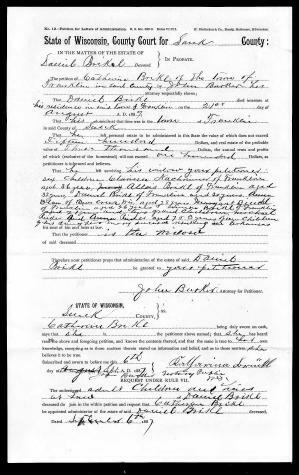 Anna Teresa Brickl married Joseph Blau, son of Michael Blau and Barbara Dobmeier, on 12 November 1884 at Franklin, Sauk, Wisconsin, They were married November 12, 1884 at St. Luke Catholic Church in Plain by Father Henricus Keonig. Witnesses were Michael Blau and Elizabeth Voelker. The Weekly Home News of November 13, 1884 reported, "Mr. Joseph Blow [Blau] and Miss Annie Brickle [Brückl] were united in the holy bonds of matrimony at St. Luke's Church Tuesday, by Rev. Father Koning of Keyesville. At the same time and place Mr. Daniel Brickle [Brückl] and Miss Mary Blow [Blau] were married by the same gentleman." 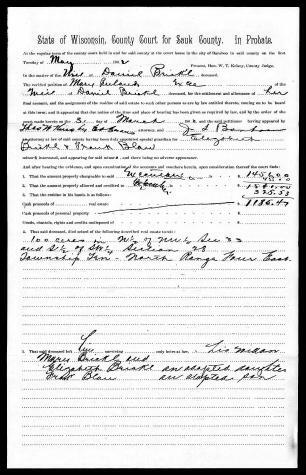 Anna Teresa Brickl was listed as a beneficiary in Daniel Brickl's will on 6 September 1887 at Sauk, Wisconsin. Anna Teresa Brickl died in April 1898 at age 38 died after a difficult childbirth. Name Variation Simon S. Brickl was also known as Simon Bruckl. Simon S. Brickl was born at Plain, Sauk, Wisconsin. He was born on 13 December 1865 at Bavaria, Germany, also reported as October 1865. He was the son of Daniel Brickl and Catherine Retzer. 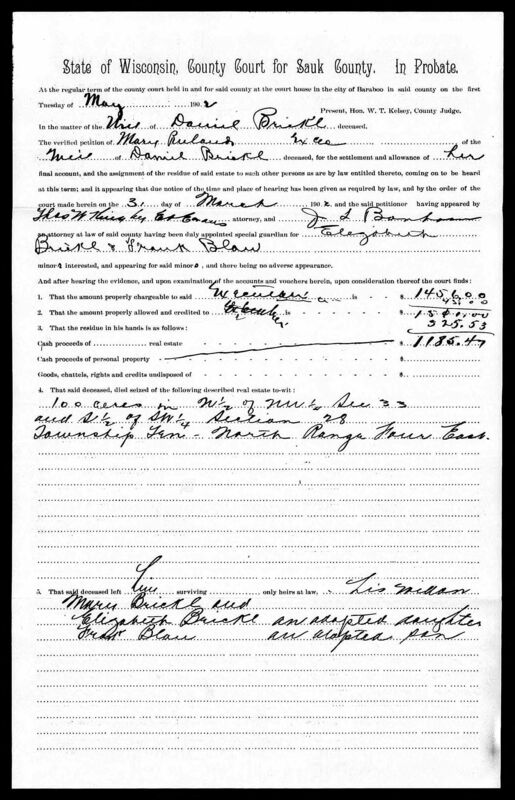 Simon S. Brickl was listed as a beneficiary in Daniel Brickl's will on 6 September 1887 at Sauk, Wisconsin. Simon S. Brickl married Barbara Blau, daughter of Michael Blau and Barbara Dobmeier, on 11 April 1888 at Plain, Sauk, Wisconsin. Simon S. Brickl died on 16 April 1960 at age 94. Simon S. Brickl immigrated in 1872. [S245] U.S. Federal Census 1900 U.S. Federal Census, by Ancestry.com, ED134. Dwelling 49. [S244] U.S. Federal Census 1910 U.S. Federal Census, by Ancestry.com, ED115. Dwelling 149. [S243] U.S. Federal Census 1920 U.S. Federal Census, by Ancestry.com, Year: 1920;Census Place: Franklin, Sauk, Wisconsin; Roll: T625_2015; Page: 4A; Enumeration District: 164; Image: 76. Simon Brickl married unknown (?). Simon Brickl was born circa 1799 at Bavaria, Germany. Simon Brickl was a shepard. Married Name Her married name was Brickl. Unknown (?) married Simon Brickl. Unknown (?) was born at Bavaria, Germany. Name Variation Ellen Wahl was also known as Lynch. Name Variation Ellen Wahl was also known as Wall. Ellen Wahl married Joseph Limmex. Ellen Wahl was born circa 1821 at Ireland. She died on 29 April 1883 at Aged 62 yrs. [S246] U.S. Federal Census 1880 U.S. Federal Census, by Ancestry.com, NA Film Number T9-1429 Page Number 26B. Name Variation Joseph Limmex was also known as Lennox. Joseph Limmex married Ellen Wahl. Joseph Limmex was born circa 1826 at Ireland. Thomas Limmex was born on 17 March 1856 at Wisconsin. He was the son of Joseph Limmex and Ellen Wahl. Thomas Limmex married Mary Ann McCluskey, daughter of Patrick M. McCluskey and Elizabeth Jane Lane, in 1887. Thomas Limmex died on 21 September 1909 at age 53. [S245] U.S. Federal Census 1900 U.S. Federal Census, by Ancestry.com, ED58. Dwelling 278. Married Name 12 April 1889 As of 12 April 1889,her married name was McCluskey. Julia Ellen Limmex was born on 30 March 1865 at Wisconsin. She was the daughter of Joseph Limmex and Ellen Wahl. Julia Ellen Limmex married Edward J. McCluskey, son of Patrick M. McCluskey and Elizabeth Jane Lane, on 12 April 1889. Julia Ellen Limmex died on 19 March 1951 at age 85. Julia Ellen Limmex had 5 with 5 living in 1900 children. She had 8 with 8 living in 1910 children. [S245] U.S. Federal Census 1900 U.S. Federal Census, by Ancestry.com, ED58. Dwelling 279. [S244] U.S. Federal Census 1910 U.S. Federal Census, by Ancestry.com, ED51. Dwelling 103.